Anna Clark signs a copy of her book "The Poisoned City: Flint's Water and the American Urban Tragedy"
Anna Clark, journalist and author of “The Poisoned City: Flint’s Water and the American Urban Tragedy,” spoke at Marquette University last Wednesday to discuss why the Flint, Michigan, water crisis is still relevant today. 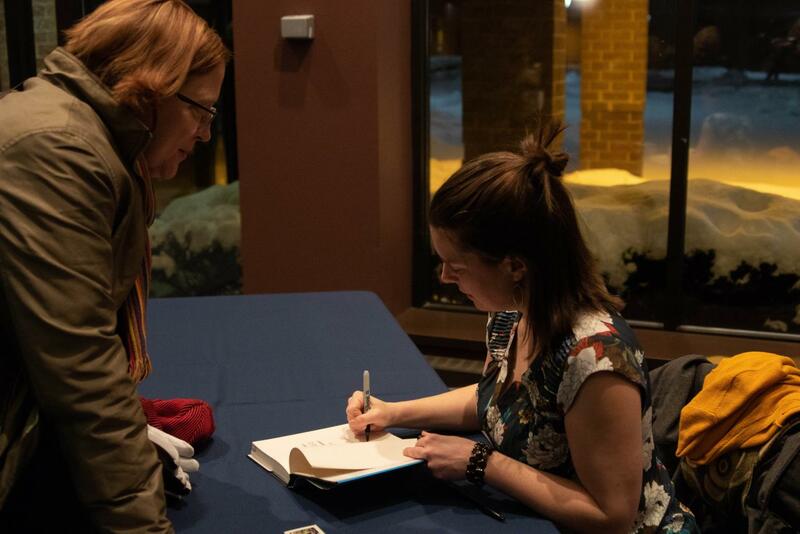 Clark spoke at two events: a Q&A discussing the process of writing her book and a presentation describing complexities of the water crisis in Flint. At the first event, Clark said she was excited to research Flint in more depth but it presented many concerns. Clark said one of her biggest challenges was trying to stay on top of her writing without becoming overwhelmed or stagnant. “It’s the hardest thing I’ve ever done,” Clark said. 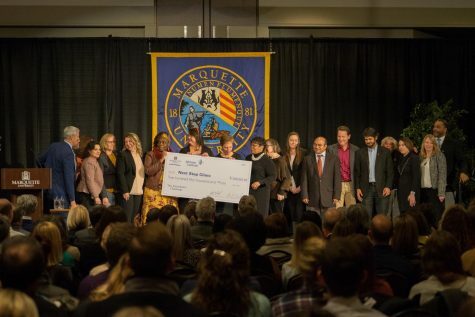 Clark first came in contact with Marquette through CJ Hribal, an English professor at Marquette, who used to teach at Warren Wilson College in North Carolina, where Clark was a student. Sebastian Bitticks, a visiting assistant professor of English, said he was excited to see if the topics he covered in his classes would come up naturally in her talk. “She mentioned the feeling of being lost in her research and writing. We spent the first week of class talking about how in order to write well, you need to be open to getting lost or losing yourself,” Bitticks said. Alyssa Tobisch, a freshman in the College of Arts & Sciences who attended one of the events, said she appreciated Clark’s unique approach to writing her book. “I found it interesting how much time she spent on drafting, especially coming from a creative writing background,” Tobisch said. Clark studied fiction at Warren Wilson College. Despite her struggles, Clark said she loved her process because of all the people in Flint she met along the way. At her keynote lecture, Clark mentioned how hard the citizens of Flint had to work for their voices to be heard. Clark said the consequences of that vacuum are very serious. The problems in Flint were ignored by government and city officials and the issues were not being publicized enough due to the lack of journalists in the area with proper equipment. “There were great diligent local journalists, but there weren’t enough of them and they weren’t resourced enough,” Clark said. Hannah Badeau, a senior in the College of Arts & Sciences who attended one of the events, said the work of journalists is increasingly more important. “We need more quality journalists to put out the effort to communicate what’s going on and get people to talk about it,” Badeau said. Hribal said the work of journalists like Clark help create an informed citizenry. “We’re going to be more and more dependent on citizen and independent journalists to write these stories,” Hribal said. Melanie Hernandez, a senior in the College of Arts & Sciences who attended one of the events, said what happened in Flint can’t be forgotten about so quickly. “This is a very real, ongoing problem, and for us to be over it and just moving on to the next news fad is so sad,” Hernandez said. Clark said the problems occurring in Flint are a repeat occurrence throughout America. “I hope people can see Flint not just as a warning, but as a model of how community organizing can have potency, even in a community that was dismissed as long as they were,” Clark said.